Our visit to the Obersalzberg’s Nazi Bunkers was part of our German Road trip (that page has links to all the hotels, restaurants and places visited). There is a huge bunker system in the Berchtesgaden hillside. Sadly, most of the tunnels are now sealed off and inaccessible. 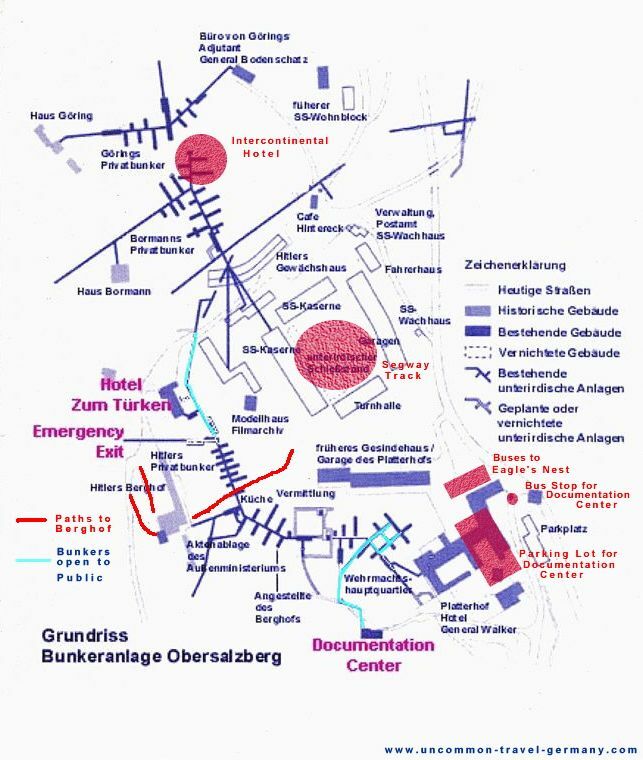 There are two intact bunker systems open to the public on the Obersalzberg. One is under the Documentation Center and included in the museum entry – although that was closed when we visited. The other bunker is under the Hotel zum Türken. There are no sign posts advertising the bunker – just a small office on the side of the Hotel zum Türken where you purchase a ticket and enter. I can’t remember the entrance price, but it was only a few Euros per person. There is a sign warning against photography. I mostly ignored that as I can only think the reason is so they can sell post cards and books. There isn’t a tour, you can just wander freely after climbing down stop steps into the bunker complex. There is a really steep set of steps that lead down to more tunnels/rooms – the entrance to Hitler’s own bunker is sealed off and an alarm sounds if you walk too close to it. It’s a really interesting place to visit. And while you’re parked at the hotel, you may as well walk down the street a little, then back up an un-made road to the site of Hitler’s house. Only one side wall left now. Closed from 8th of January 2019 until they announce a new schedule.